I’ve made the trip to and fro Texas to Colorado many times. Having said that, I haven’t made too many stops along the way. Usually, I’m destination bound. This year, I decided to make the road trip more interesting and found a variety of places to stop along the way. Fortunately, my friend Nancy is self-employed and has a flexible schedule like me. As such, she was able to join me for dinner and a festive night at The Broadmoor. The luxury resort is always adorned in Christmas lights during the holidays and it is fun to see the exquisite resort decked out in decorations. Getting to the resort Tuesday afternoon was a bit rough given an accident on I-25 that held up traffic for 45 minutes, but I suppose our day was better than those involved in the crash. We eventually arrived around five, got a room with a lovely view in the west tower, and strolled past the lake to Happy Hour where we enjoyed a drink and snacks at The Hotel Bar before enjoying a fancy dinner at The Summit. Nancy order the “Angry Trout”, the Summit’s signature dish. The fish is cooked with its tail pulled through its mouth, so it looks “Angry”. I went with two appetizers: a mushroom, truffle bisque which was very rich and tasty as well as a magnificent bowl of mussels. We ended the night enjoying the lights around the lake. The Palmer Trail is located in Bear Creek Cañon Park which is owned by Colorado Springs. The trailhead was only a 15 minute drive from the Broadmoor into the foothills very near the Red Rock Canyon Open Space. The Palmer Trail (section 16) was a bit of a misnomer at first. We couldn’t find any trail signs that mentioned it. We knew we were completing a loop however, so we followed the directions to Red Rock Loop which was also the most heavily traveled trail. After about 1/2 mile we reached a trail junction with a detailed map and a post directing us up a steep slope which turned into several switchbacks. We climbed for most of the next two miles or so before reaching a summit which afforded excellent views! The trail, mostly a soft red dirt, led us through the forest down to High Drive, a dirt road blanketed in a thin layer of icy snow. We took short careful steps along road before reaching the paved surface where we climbed to the car. I wasn’t terribly enthusiastic about having to walk on a paved road, but it wasn’t for very long, and otherwise the 5.2 mile hike was quite nice. Capulin Volcano National Monument is home to an extinct volcano which erupted 60,000 years. The national monument offers five trails which are all very short in length with the longest being two miles. As such, the whole park may visited in an afternoon. The most popular trails appeared to be the Crater Rim Trail and the Crater Vent Trail both located at the parking area by the cinder cone after driving the spiral road to the top. For those who don’t like ledges like me, this was not the most exciting drive! I hiked the Crater Rim Trail first which was the hardest in the sense of steepness. The one-mile loop is paved, which was disappointing to me, but I can understand why as it circle the rim of the cone which rises over 1,300 feet above the plains and provides spectacular views of the surrounding area. Next I followed the 0.2 mile Crater Vent Trail 105 feet down to the bottom of the crater and its plugged vent. I don’t think I’ve ever been in the bottom of a volcano. Finally, I drove back down toward the visitor’s center and stopped at the parking area for both Boca Trail and Lava Flow Trail. Boca Trail is two miles while the Lava Flow Trail is only one mile. I only felt like hiking one of the two paths, so I picked the longer one. The path led me through dormant prairie grasses, scrub oak, junipers, pine trees, and chokecherry bushes for which the volcano is named. Capulin is the Spanish word for chokecherry. The information listed this two-mile hike as strenuous. I didn’t find it to be difficult with the exception of stepping on small pieces of lava rock which seemed to roll on the hard surface making me slip a handful of times. Overall, it was nice break to take from driving, though I don’t think this National Monument requires more than one visit. Having heard that, I decided to follow the trail named after runners who helped build it rather than the most popular trail in the park which is also responsible for the most heat related injuries and deaths to people and pets. Fortunately for me, I didn’t have to worry about warm temperatures. It was hardly 40 degrees when I started and the sun was struggling to peak out from the thin layer of clouds. While I hoped the fiery ball in the sky would brightly shine on the myriad of colors in the rock striations, at the same time, I didn’t want to get too hot on the eight mile hike. I skipped along the trail fairly quickly as I only had three hours to complete which was barely enough time to truly enjoy the hike, but I still managed to stop and snap photos of cacti, hoodoos, and canyon walls peppered in shades of purples, browns, and oranges just to name of few. Eventually, I reached “the end” of the lighthouse trail, but I recalled the ranger mentioned I could climb up to the rock formation. In addition, I saw some people scrambling on the rocks. The climb was steep, but not too difficult, and completely worth the effort! I walked out on a plateau “book-ended” by two towering formations which provided fantastic views of the expansive canyon below. I noticed the couple I had spotted earlier continued up a steep path to the top of one of the formations…so cool! I’m so glad I followed them up. I didn’t spot any wild life while hiking, but passed a deer on my drive in and flushed a bevy of dove hidden in the thick brush as I turned the corner. That made me jump! I suspect the desert topography would be quite pretty in the spring when the cacti are blooming. I’ll definitely have to visit Palo Duro Canyon State Park again. I was pleasantly surprised by this park. 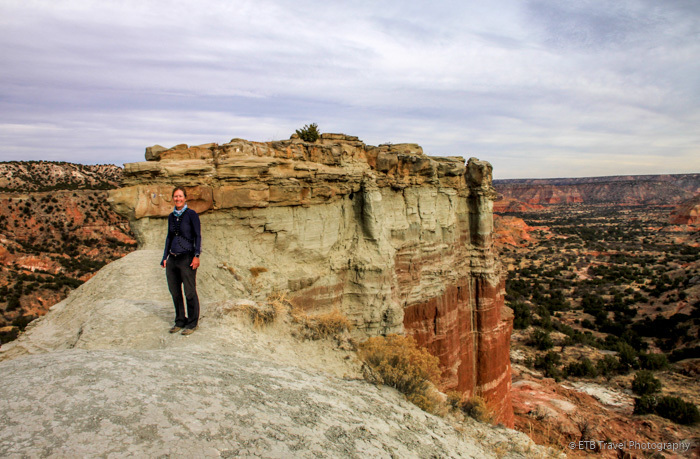 With Palo Duro Canyon State Park being only an 1.5 hours away and being the second largest canyon in the United States, I believe Caprock Canyons State Park might get overlooked. In addition, it is a little out of the way. I arrived at this park on a very cold, overcast day, maybe 23 degrees. While the weather muted the lovely colors of the canyon, I certainly kept cool while hiking and had the trail to myself! The park offers a variety of trails. I wanted to see the natural spring at Fern Cave, as such I connected three trails (Canyon Loop Trail, Upper Canyon Trail, and Haynes Ridge Overlook Trail) for an approximate 6.5 mile loop. The trails are also named Trail D, C, and B, respectively that was helpful to know while following the trail markers. This hike was fantastic! At the beginning, I was lulled into a false sense of security while following a wide, smooth red trail past a variety of rock formations. The information had suggested this was a strenuous hike, but at first this was not the case. Soon, the wide trail turned into a single track which led me through a variety of vegetation. All I could think was I’m glad I’m not here in the summer heat and bugs! Soon I was following a wash and then I found myself climbing. The climb was gradual up until I reached Fern Cave. A small amount of water trickled over the rocks as I admired the ferns and ice-cycles at the same time! From Fern Cave, the trail became a little confusing. At a trail junction, a marker pointed with a large arrow to the left and a small arrow to the right but it didn’t indicate a trail letter. As I climbed up, I remembered a split in the trail, and deduced the large arrow to the left that I was now seeing is just pointing to a return way back on the same trail C. This turned out to be right, but I was certain until after referencing the map which suggested I needed to climb 0.2 miles to the highest point of the park before connecting to the Haynes Ridge Overlook Trail. Fortunately, I had my Fitbit on and watched the mileage as I bounded to the top and found several trail signs. This trail offered fantastic views and if it weren’t so cold, I likely would have meandered rather slowly. Having finished the climb and being exposed to the wind, I fought off a chill by running portions of this flat section while stopping occasionally to admire the multi-colored cliffs. Soon I reached the descent which seemed much steeper than the climb. I followed several rock stairs down to the trail from which I began. This would be a very challenging hike in the Texas heat. While I wasn’t enthusiastic about the cold weather, only having to carry a couple bottles of water was far better than what would be needed in the summer as indicated by the countless signs warning hikers to turn around if they didn’t have water. I really enjoyed the landscape changes and variety on this path. I would definitely come back to see other trails, the bison and the bats which are all part of this park. The Mansion is a famous, luxury hotel in Dallas where many of the stars stay. Its dark, traditionally decorated bar serves of course serves pricey cocktails, and I couldn’t imagine how my friend, Phil Pritchett’s rock band would fit in, but it did. He put on show, dancing, playing the guitar, and belting out English cover songs along with his bass and drum players. The British Are Coming plays there about twice a month where several regulars come to see them. In fact, the people watching is worth the price of admission! Well, most people say the stadium itself is worth visiting, and I believe a tour may be arranged, but we went to see the Cowboys. Unfortunately, they did not have a very good Christmas Eve. Regardless, it’s fun to go to a game! Previous Post My First Hut Trip: Broome Hut!